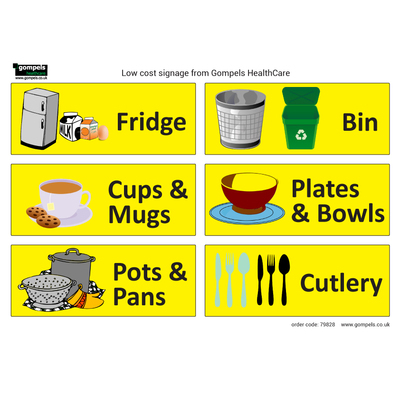 Designed specifically to aid patients in residential and care homes, our Kitchen Identification Self Adhesive Sign A4 helps to maintain their independence. As part of our low cost signage range, these vibrant signs can be easily affixed to any hard, flat surface with the self-adhesive backing making them perfect for doors, walls or cupboards. Helping identify the routes to different items around the kitchen, each one features bold text and easily recognisable imagery. The high quality and flexible vinyl has a waterproof surface that can be quickly wiped clean along with your existing routine. The perfect addition to your business and one that promises not to break the bank. Looking for other signs to place around your workplace? Why not consider our Hand Washing Non Marking Adhesive Sign? Or, how about our CCTV in Operation Self Adhesive Sign?